Pierre Lahutte (right), IVECO Brand President, attends the Hamburg opening. 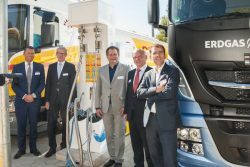 Shell completed the inauguration of its first LNG Retail station for trucks in Hamburg, Germany on September 18, adding another milestone in its journey to roll out LNG for the road transport sector within Europe given the increase in freight traffic on European roads. IVECO was in attendance with the Stralis NP 460. The new LNG station is located in the south of Hamburg at Georgswerder Bogen, an important refueling spot for freight transport near the Hamburg Port. IVECO participated in the official inauguration at the location. The station is strategically placed near the Hamburg Süd motorway interchange and motorway triangle and has the station has the capacity to refuel more than 200 trucks a day. IVECO’s participation at the event is part of its collaboration with the energy company to promote the development of the alternative fuels network in Germany. The transport sector generates around 20% of energy-related CO2 emissions in Germany. LNG offers significant advantages by way of CO2 emissions and air pollutants when compared with diesel. Virtually no particulate matter is produced, and fuel costs tend to be lower as well as less noise being generated by the engine. Today, around 5,000 LNG trucks from the manufacturers Iveco, Scania and Volvo are already on the road in Europe. A significant increase is expected between now and 2030. This will be spurred by funding from the federal government. “LNG plays an important role in the fuel strategy of the Federal Ministry of Transport and Digital Infrastructure. We are therefore pleased that Shell is engaged in building up the tank infrastructure,” said Guido Beermann, state secretary in the Federal Ministry for Transport and Digital Infrastructure at the inauguration in Hamburg. 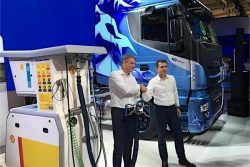 Shell will also be at IVECO’s side at the IAA Commercial Vehicles (IAA) to promote the development of the CNG and LNG refuelling network in Germany. The energy company will be present at the IVECO stand displaying a CNG and LNG refuelling station. In addition, Lauran Wetemans, Shell LNG Marketing & Trading General Manager, will speak about the collaboration at the IVECO Press conference. Shell continues to expand its European LNG station network and Hamburg is the ninth Shell LNG station in northwest Europe. Seven sites are already open in the Netherlands and one site in Belgium.